I have been the mage rolling in dragon’s blood to see if it had magical properties. I have been the druid who was upset that her overly large dire wolf companion was not permitted in the local tavern due to civilian panic. I have been married to a paranoid space archer, hunted across galaxies, and set adrift in time. I have been the villainous duke, sacrificing his people to gain power from the dark gods, and I have been the werewolf so old that he has lost his mind to the animal hunger. I have been the re-awakened vampire priestess, and the valiant heroine trying to protect her city. I have saved cities, dimensions, timelines, and gods. I have killed friends, prophets, and commoners alike. Like readers, role-players and Storytellers/Game Masters/ Dungeon Masters experience hundreds of different lives, while still only living inside their own skin. So, it’s no secret that I have been involved with roleplaying groups for quite some time, at least 14 years to be exact (Give or take a few days, or hours, I can’t really remember). These experiences have varied; from forum and group posting, nightly chat room meetings (when it was still possible to find a chat room filled with decent people who wanted to actually write), to tabletop gaming and LARPing, I have had my hand in many posts when it comes to playing out characters and writing stories cooperatively. Roleplaying was when I really got my start in creative writing; I started my experience around the same time I tried to write my first ‘novel’ which, looking back on now, was a pretty cringe worthy endeavour for a 13-year-old. I like to think that roleplaying and writing in a co-operative fashion has helped to shape me not only as a creative individual, but as a person who is able to work well with others. I think it compliments my experience as a reader, and helps to broaden my understanding of people and the world. 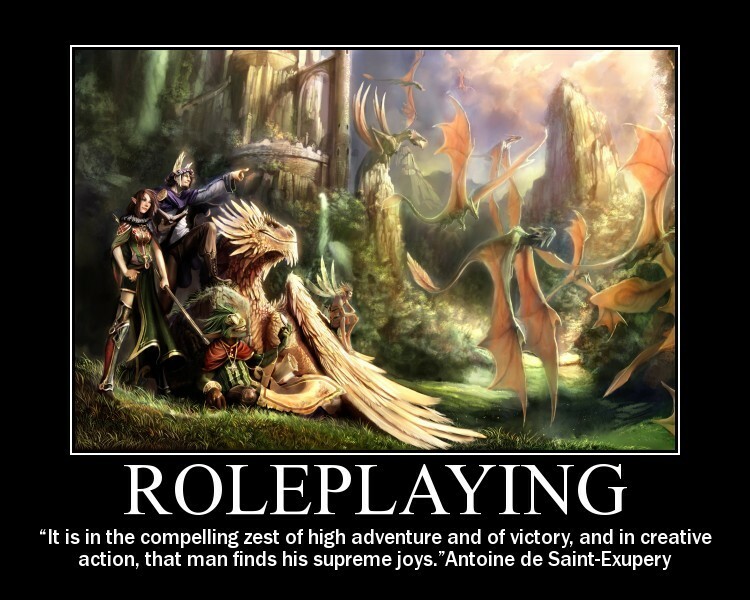 Over the years I have seen online roleplaying evolve; from chat rooms to forums, from forums to social networking sites, and finally to tumblr and other such creative outlets. Let me be honest here; I don’t really understand how tumblr works on the best of days, but it is still a pretty decent tool for finding skilled writers and people to bounce creative ideas off. These early writing and roleplaying experiences opened the doors for me, and got me interested in games like Dungeons and Dragons and World of Darkness, where co-operative story telling is central to making a great game. Through all of these experiences, I’ve learned a few lessons and tricks, both as a DM/GM and as a player. What I want to do for you now, is lay out some of those elements. Maybe you have been roleplaying and writing for years, or maybe you are just getting involved, but these lessons and tricks may help you out, or you may just nod along and agree based on your own experience. As a Dungeon Master or Game Master, it is our duty to set the scene, to hook our players, and to set them on a path to adventure and fun. As a co-operative writer, it is out duty to work out the general direction in which we want to begin writing. Both of these require an infinite amount if creativity, patience, and a willingness to put in long hours of thought. The absolute worse thing that you can do in either situation is to railroad. Yes, having a goal in mind and milestones set up are excellent, but you don’t want to limit the ways in which your co-writers or party can choose to get there. I’ve always been fond of the “story arc” over the “store line”, as it implies that there is a certain build as you progress. I’d like to push this further and say that there is a “story maze”. What I mean by this is that you have a fixed beginning, a fixed middle, and a fixed end point, but the ways in which the party or partner can arrive at these key story points are not reduced to a single line of progression. Have side events ready, little moments that offer some fun and experience, some sort of reward. Don’t try to force your single agenda or story, no matter how amazing it is (or you think it is). Be willing to let the party and your partner find their own way to those moments. Yes, there will be intersections that they cannot avoid, and you can leave them hints and clues that will lead them back if they start to stray too far, but don’t yank on the leash and choke them when they want to explore. Likewise, don’t make the maze insanely devious or daunting, or else they will get completely lost in the foliage and you will all forget the goal. make the maze interesting, and keep the walls just above eye level, so they are still surprised when they do get where you want them to go. Just like railroading a story, saying no to your party and your partner can lead to some very heated conflicts. Like in improv, saying “no, we aren’t doing that,” is like denying the creative imput. Remember, you are not trying to work against your party or partner, even if you are playing the villain. If your partner or party decide to try some solution to a problem, but it’s not EXACTLY how you would have solved it, don’t discredit their effort. Instead, take a step back and think if that effort would have logically worked, even if it was as insane as charging on to a field of battling ogres covered in dragon’s blood and dancing in order to distract them to buy the civilians time to escape. It may not be YOUR ideal solution, but that does not mean that it can’t work. Who knows, it may become one of the best moments among the party or between you and your partner, and open new doors that you hadn’t even thought of when it comes to how the story can progress. This may not apply so much to the DM/GM situation, but it is a valuable tool. While having subtle characters is excellent, having no clue what any of your party members are actually doing can be a major issue. In group forum and one-on-one writing I like to call this the OOC (Out of Character) discussion. While you have an agenda in your writing and for your character, being 100% obscure and non-communicative has one of two outcomes: your character is evil and it comes as no surprise when they betray the rest of the party, or you end up having absolutely no fun because your major concern is keeping everyone else rom knowing anything about what is going on. Take the time with your group or your partner to find out what it is they want to accomplish, what it is they are looking to gain from playing a given character, and incorporate those goals into your own goals. All players should be able to be involved, both in character and out of character, in taking the story in certain directions. This is a bit more level when there are only two people involved in the co-operative writing, but it is useful in the party environment as well. It keeps everyone involved and feeling as though they are really contributing to the eventual outcome of the story. There is nothing worse than having created an amazing character, only to have them turn out to be a faceless pawn, dwarfed by the desires of a single person. God-moding, meta gaming, Mary Sue-ing. All of these imply the worst case scenario for the creative and dedicated role player. It implies the creation of a character who has, among other things, uncannily powerful abilities (that surpass all others and are even better than what they should normally be. Think of it like an over-powered house rule spell of magic missile . . . where that missile is not only heat seeking, but nuclear powered and able to pass through solid walls until it hits the target.) This applies to players and DM/GM’s alike. No one is untouchable, even if they are “the ultimate good” or the looming “big bad.” You cannot control the actions of your party like you would a puppet, even if you are the master puppeteer. You can only influence. Please, don’t god mode, as it drags everyone down when they don’t get to play their role because someone else is already “on it because I once found a scroll of +10 to any skill I wanted and I’ve saved it for this very moment,” or because it seems like their actions have absolutely no influence on the progression of the story or the outcome of events. In canon written role-play, these are often the “OC/ Original Characters” who suddenly appear on the scene and seem to know exactly what is going on, exactly want needs to be done, and trump the most powerful characters in the given canon universe. I hate to sound like a broken record, but please, no god-moding. It takes all the fun out of roleplaying for everyone except the god-moder. There is nothing quite like roleplaying and roleplaying games to bring out the most creative crazy ideas in people. All of this, of course, can’t work if you don’t seriously consider game mechanics. They are there for a reason! Your clerics and paladins should be behaving in certain ways, and the threat of the removal of divine (good or evil) powers should not be tossed out the window. It should not be done lightly, but it should always be in the back of these character’s minds. Just like you can’t have a ranger or druid slaughtering innocent forest animals for no reason, you also can’t have alignments and builds that truly violate the carefully established game mechanics. Yes, there is an element of creativity, but there are some of these elements that can severely handicap a GM/DM in their ability to create a story and keep everything functioning. Say you wanted to be a necromancer, but you wanted to be”good” aligned. While and interesting dynamic, it would drastically alter how a GM/DM structures their story, especially if there are divine elements at play in their larger plot. If you want to be a good aligned Necromancer, you have to keep in mind that there are other good and neutral aligned characters, likely in your party, who would be duty bound to kill you for violating the sanctity of life and death, not because they dislike you, but because it is integral to how their character mechanics work. This mostly has to do with party games, so to relate it to forum posting is a bit more difficult. I would say the equivalent is respecting limits set by characters, and playing canon characters with at least a comparable level of understanding for who they have been written. Hermione Granger should be intelligent and stubborn; Rogue should have major issues with trust and letting people in. Be true to the personality, no matter what story parameters change. This goes double for one on one role-playing. Just because you are writing with a partner, don’t assume that your characters are immediately going to click. Let the connections work themselves out. Yes, we all love combat, and yes, we all also love loot. However, doing nothing but killing monsters and tackling long session of combat can get really boring. Just like a “monster of the week” progression, repeated the same thing over and over can get tiring and de-motivational for players. There are more ways to earn experience and to progress as a character than through combat alone. Give your partner or players things to think about, mysterious to work out, riddles to solve, personal troubles to deal with. This is were back story can come in handy. Whether you are the GM/Dm, or the co-writer in a one-on-one session, have your counterpart(s) come up with a back story for their characters. If you are playing canon characters, see if there are things your partner would like to work in, to round out their characters. Once those are established, find ways to work them in to the storytelling experience. Not only will it help keep the roleplay from becoming monotonous, but it will also be a way to make sure that they are invested in the story and in their character. It will also help to keep things rolling and prevent things rom falling flat and coming to a complete halt. I like to use riddles, word puzzles, and guide my players to explore their interests through their characters, or to explore their characters interests through the world. I’ve seen this result in hilarious side adventures and stories that help to make characters more real: ever wanted to be worshipped like a god by a backwards village? or, maybe you’ve been wanting to join a guild, but just can’t manage to carry that oddly bloody bag of cabbages past the doorman? Puzzles and roleplaying are key to helping the experience become something memorable. In writing and story driven versus experience gaining stories, this can be related to adding in another genre; sure, you want slice of life, but that doesn’t mean that you can’t weave in elements of intrigue, suspense, mystery, or even horror. This will all depend on the partner/party dynamic, but there are so many choices that they are, quite literally, almost endless options. There is nothing quite the same as feeling the power you get to wield as the adversary. Having the chance to pay the “evil” (subjective to campaign, as we all know, so instead of “evil”, lets just call them the antagonist) role is the cherry on top of the perfect sunday. It is not an easy role, but it comes with a lot of really nifty benefits. However, you have to remember that you are not playing AGAINST everyone else; there is nothing in it for you if you destroy your party or your partner every time, and they will become angry and dispassionate about continuing. Instead, you want to offer a challenge to the protagonists; in most cases, you are playing on both sides of the line when you take on the role of the antagonist. This character is a tool through which you can guide and build up for party or partner, it is one of the major simmering points that will help you boil the story up to its penultimate moments. Your antagonist should not be all-powerful (even if they are a god), and they should not be untouchable. Unlike Descent (Fantasy Flight, thank you for this game, but it is frustrating to lose, both as a player and as the overlord), you gain nothing from making your party or partner lose every encounter. At the same time, you don’t want them to just be able to walk over your key antagonistic figures. There is a very fine balance between playing a great antagonist, and either playing an overarching tyrant or an underpowered pushover. This has by far been the hardest part about roleplaying for me, and the writing which I struggled with the most. Ultimately, you have to find a way to feel as if you are succeeding when your players and partners surmount your challenges, rather than looking at it like a lose for yourself. most of all, you have to learn to enjoy the dark side, or it will become tedious to keep coming up with new flavours and encounters to keep both you and your party invested in the experience. It’s not great to hear, but sometimes we are not perfect. Writer, Player, or GM/DM, you have to be open to constructive criticism. It might seem like an attack on your ability, but if you listen, it can help you grow not only as a player, but as a creative talent. There is the saying “give me the grace to accept what I cannot change” . . . or something like that; in roleplaying, you have to opportunity to adjust and change those things that don’t work in your style, in your skill. Take them. This can do hand in hand with the railroading story. Listen to what your players and partners want when things seem to hit a wall and, barring extreme cases, you can most certainly find a way to work things out, no matter what role you are playing. Be willing to adapt and consider change, it is the best way to deal with these kinds of problems. No one gains from talking or playing against a brick wall, so be aware! On the other side, if you are writing with a partner or for a party, and no matter what you do you just don’t seem to be meshing on any level, you CAN say so. Talk about what issues you are having, where you think improvement could be made, and be willing to be told the same things that you tell others. The best thing you can do is incorporate the changes, and come back. You don’t have to cater to everyone, but you do have to make sure that everyone can get on the same level, even if that means you need to step up your own game! If you are having difficulties, either with the story or your character, you have the ability to take a step back and re-evaluate your approach. You may not be able to reallocate ability scores or skill points, but you can figure out a way to make those factors work FOR you, instead of against you. It’s like having a social rogue character with really high scores to diplomacy, intimidate, and bluff, but as a person having a hard time making those come across in your in-character roleplaying. You as a person may be absolutely horrid at diplomatic interactions, or crafting a foolproof lie ( My social rogue couldn’t bluff for the life of her, even though she had a score somewhere in the 30s. Notoriously she attempted to pass herself off as ‘Room service; cleaning and incineration’ when attempting to sneak in through the back doors of one of the outer levels of Hell.) It’s all about finding a way to have fun, and to make the skills you want your character to have work for your playing style. If you are not having fun with your skills or your character, you need to openly talk about it with you DM/GM or your partner, and see what kind of agreement you can come to in order to make your experience fun. This type of game and writing it all about figuring out what works and what doesn’t, and how to navigate the churning seas that lie between your imagination and the game itself. Roleplay is where we get to explore not only the action and adventure, but the inner thought process of our characters. It’s not about having all the cool powers and gadgets (thought those are always fun), but it’s about making your writing partners see the inner character, the subtle nuance behind the choices and the action. It’s about giving them some emotional connection to you, beyond just the fact that your characters live in the same world and happen to travel in the same circles. Above all, and I mean this, you need to be having fun! If you are not having fun, as a player, a partner, a Game Master, etc., then you need to address the issue. If you aren’t having fun, the other people you play with are going to notice, and it is going to colour the experience for them as well. Sometimes it means you need to step back and take a break to reevaluate your interest in playing. Sometimes it means you’ve fallen into a rut and you need to break some habits that have become unconscious inclusion. Most of all, it means that something isn’t going to way it is supposed to. Even if your characters are in the most dire situations, if you are not invested, if you are NOT having fun, YOU need to speak up!